I can no longer stay silent. I’ve recently read some travel blogs that are giving incredibly bad advice for spring coats. It’s upsetting because the wrong choice in outer wear can really, really, really negatively impact your comfort on a trip. Pick the wrong coat and you end up a soggy mess, huddled in your hotel room waiting for the rain to stop. On the other end of the spectrum you’ll end up dragging around a big bulky coat that will slow you down. It doesn’t have to be that way. Pick the right coat and your travels are enhanced, not degraded. Sudden outdoor swings in temperature from freezing to hot and humid, or swings from hot to snowing. All in a matter of hours! A large difference in temperature inside Vs. outside. This means packing the jacket while indoors. Guard against the following characteristics in a spring coat. You’ll pay the price if you don’t! It is heavy. A coat that weighs 3 pounds (1-1/2 kg) is never a good choice if you have to carry it around on a hot day. The coat is water-resistant, not water proof. It will leak after a few hours of rain. It has a fur hood. Not only is it inappropriate for warm days, it adds extra weight to the garment. It has a heavy lining. A lining adds weight to the coat. It also adds warmth to the coat so you can’t use it on warm days. Bulky linings hinder layering for warmth on cold days. It is bulky. How will you store it if the weather warms up during the day? It has no hood. You’ll need to keep your head warm / dry some other way, such as a hat or umbrella. If you are like me you’ve managed to leave the hat and umbrella back in the hotel room where it is useless. Look for these features when shopping for a spring coat. The sales tag lists the details for the coat. When shopping on-line, look at the details section or specs section of the web page. It is waterproof (not water-resistant) to handle touring outside in spring storms. A water-resistant coat will soak through after a half day outside, limiting your trip. Compare this to a waterproof coat which keeps you warm and dry. It has taped or welded seams to prevent leaks. Seams are always a leakage point in coats. Taped or welded seams prevent leaks in an all-day rain. It has a hood for rain / wind protection. Some coats have detachable hoods that store in a pocket. Others have roll-up hoods that store in the collar. It is packable so you can store it on hot days or when inside. Most packable coats are thin and unlined. The lack of lining also keeps the coat lighter. A truly packable coat will actually roll up and store in your day bag. It is light so your back doesn’t get sore from hauling around excess weight. A good packable coat weighs less than one pound (1/2 kg). The cut is loose enough so that you can wear a sweater or fleece under it for warmth. Layers are a key to temperature control. A coat needs to have generous room in the arm pits and shoulders to accommodate layers. It comes with a performance guarantee. These coats are expensive and a good manufacturer stands behind their product. Lastly, it needs to look nice. I prefer trench coats because they define the waist, giving a feminine touch. So are there coats out there that fulfill all the requirements above? The answer is a resounding yes! You’ll pay a little more for them, but you’ll be able to wear them for years. I’ve found that the best coats come from manufacturers that have a background in mountaineering. They understand that a coat is your primary defense against the elements. In the US I would suggest looking at Patagonia, Marmot, REI, Columbia, Mountain Hardware. How about you? Do you have a favorite? Good advice. I hadn’t really considered waterproof/water resistant. I wear a boiled wool cardigan under an unlined coat and am warm as toast. Yes. Many times I’ve worn fleece under my unlined rain jacket, even in the middle of winter. It is plenty warm and I can remove the fleece if the weather changes! Me too – I spent three months in UK in winter/spring and wore a coat that meets your requirements. Perfect in heavy rain and warm as toast with a couple of layers underneath. I’d say what’s suitable for spring will often work for winter as well. One comment – length. I find I need the coat to cover the bum are – doesn’t need to be much longer than that, but the right one will look good with jeans, skirts etc. I’m at present making my own goretex jacket – slowly, one that is light, waterproof and looks good with everything, dressy as well as casual. The Southridge appears to be a performance rain coat. It weighs a full pound (16 oz), which is heavy for a short coat. It appears that it is designed more for camping and has a lot of camping features such as adjustable hood and cuffs. It also appears to have extra fabric under the arms. I think that’s where the extra weight is coming in. The Marmot Precip is a very similar coat but comes in at 11.4 oz. Have you considered it? In the end though it is about what works for you. Thank you, Cindy! I liked the REI Kyoto trench coat. It’s so cute and very lightweight. Unfortunately for me, the size small is a smidgen too tight in the hips and the medium is way too large. Darn! I earned a very large dividend at REI, so I was thinking of getting the Marmot Southridge and having a tailor shorten the arms and add elastic at the cuff. I’ll have to try the other jackets at REI first. Great tips! That peach/coral one really caught my eye. Fashion & function! Yes! I chose those examples to show that we now have a wide variety of great choices. I usually go for the neutral colors so I can wear the coat on business. I also get bored with bright colors after a year or so. But the coral is so very pretty. Many of these coats come in other colors too – yellow, blue, even pink plaid. My favorite spring coat is Marmot. I actually have 2 and love them both. I own a grey Marmot Elan and get lots of compliments on it. I have a North Face Grace that I wore for years before that until I wore it out. The Grace had a very flattering profile. I have a Helly Hansen coat (the Lyness!) and I LOVE it! It’s super lightweight and stylish, has fun colors/patterns, a hood, keeps me dry, and packs well. I’ve layered it with great success. 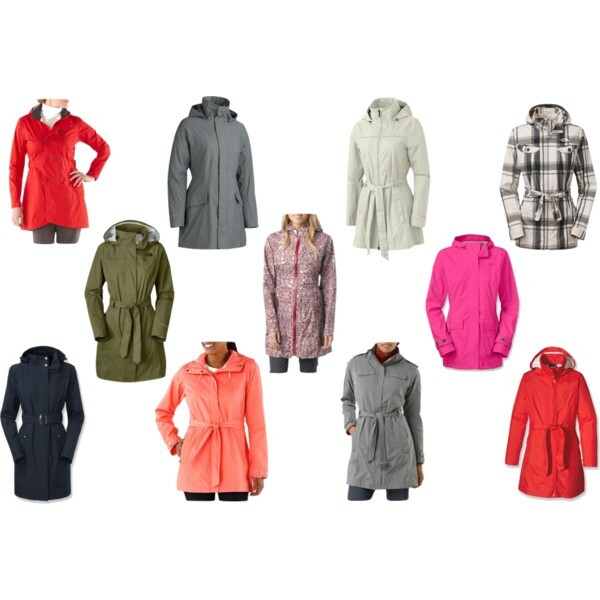 Helly actually has a whole variety of rainwear including some options with zip-in/out insulation that might be nice for people who sometimes want something warmer. I wear mine traveling, biking, and around town! I haven’t used the Helly Hansen line at all. I know REI carries some of their products. Thanks for the insight! May I have one of those coats?! I have always used my trusty normal raincoat, but always hate how blah it is. You have officially planted a seed and Ill be on the hunt for one of these now! The links will take you to the sellers. If you are looking for a bargain then I suggest end of season sales where they are selling off last years colors. I also suggest places like Sierra Trading Post for discounts. Sometimes you find great stuff, other times nothing.